The future of integration is now. What do I mean by that? I mean, we have seen many examples of how friction welding is seamlessly integrated into an automated manufacturing process. A number of our customers are already working with us and integrating friction welding technology into their production process. Based on their successes, it is the right time to take advantage of this innovative process that leads to (1) process repeatability, (2) improved cycle time, (3) increased production volume, and (4) cost savings. At MTI, we’ve advanced joining technology with our state-of-the-art friction welding process. Whether rotary, linear, or friction stir, friction welding can save time, money, and resources throughout the entire welding process. We provide the right solutions to our customers by focusing on their application, automating the process, and coming out at the end with the highest quality parts. Let’s walk through a typical scenario that MTI faces on a weekly basis: a customer approaches us with a set of components and specifications that need to be joined and manufactured into a final product. Combining our knowledge of many friction welding applications along with our 40 plus years of technical know-how, we can develop an automated process to meet just about any challenge. 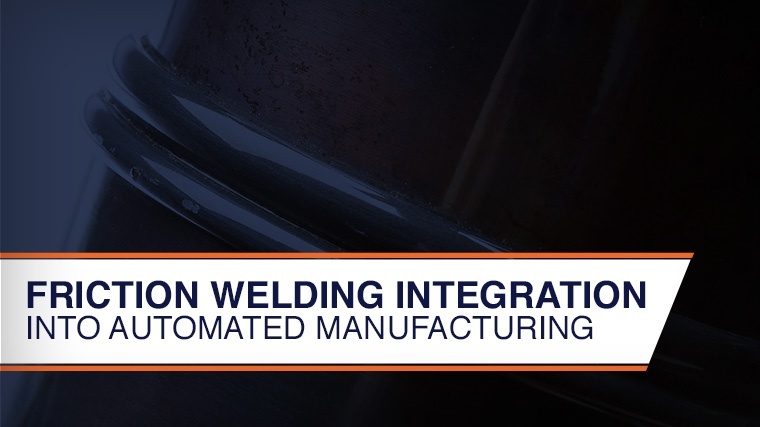 We’ll work on establishing the most efficient way to seamlessly automate the friction welding process to increase production rates and eliminate as many unnecessary steps and operations as feasible, all while maintaining time cycle goals. Our intent is to maximize the efficiency of the production space available. Depending on a customer’s parts, manufacturing processes, and cycle time needs, automation may include conveyers, robots, fixtures, in-line measuring systems, data gathering, and any number of other operations. The key is to have an integrated cell that friction welds the two components efficiently, while providing any pre or post processing of the part all within the cycle time required. While you are probably using automation in your manufacturing process now, it’s still important to understand the advantages of this process. Here are some key elements that make an automated manufacturing process the smart way to go. Repeatability and accuracy is increased¬ – the accuracy in parts is increased when done by a machine versus a human because the machine is programmed to specific parameters, leading to less mistakes. With automation, we can add several operations into an automated cell, and the part will come out fully-tested for length control, dimension control, and finished machining. Labor Savings – labor costs can be reduced because of the efficiency of the automation process, resulting in financial savings for both the manufacturer and their customer. Safety – some production operations may be inherently dangerous if done manually. With that in mind, having machines do some of the “dirty work” increases employee safety. Production cycle time reduced – since the machine is programmed for a specific task and will work until it’s stopped or reprogrammed, production cycle times can be managed to provide the most efficient and consistent process. Increased production volume – efficiencies gained through automation may lead to increased production throughput, which in turn leads to improved profitability. Finally, friction welding when combined with automation provides a complete menu of turnkey solutions for our customers. Our expert engineers have deep knowledge and understanding of the friction welding process and the wide variety of materials that can be used. Through our collaborative partnership approach our sales and engineering team will solve you production problems involving you every step of the way through the quotation design and manufacturing process. With our machinery and know-how, we are your solution provider to get the most out of each material, making sure you get the highest quality parts, efficiently produced to your specifications. We will build a machine that makes your part, we will make the part for you, or we will help you make your part even better. To learn more about MTI and our processes, visit our website and watch how friction welding can be put to work for you.